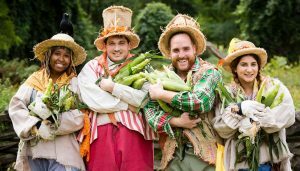 Feast on a bounty of corn-centric delicacies and take part in a bevy of hands-on, corn-related activities at the Lower Hudson Valley’s only corn festival. Play games, compete in corn shucking races, and learn how to make a corn husk broom. Enjoy cooking demonstrations and discover the irresistible charm of English country dancing in the barn. Traverse a kid-sized mini maize maze, tour the 18th-century Manor House and Mill, and watch how corn is ground on a quern stone. Enjoy live folk music all day long! Online Admission: $16; $12 for seniors; $8 for children 3-17. Free for members and children under 3. Prices are $2 per ticket higher onsite and over the phone.